The region of postshock solar wind flow at Mercury, Earth, Jupiter, and Saturn is called the magnetosheath. As the physics of the postshock flow at Venus is basically the same as at the other planets, we will call this region the magnetosheath even though the term ionosheath has at times been popular. In this section we examine what is known about the flow properties of the magnetosheath, especially near the ionopause in the region known as the plasma mantle. Are the properties of this region those of a viscous boundary layer transferring momentum from the magnetosheath to the magnetosphere, or are they the properties of a mass accretion layer. In the terminator regions of the magnetosheath, plasma measurements show that the plasma flow direction is satisfactorily described by the hydromagnetic model. Fig. 13. Direction of flow (arrows on the upper part), ion temperature (in the middle) and velocity (below) as measured by Venera 10 RIEP on 29 October 1975. Location of the shock and the boundary of obstacle as well a flow direction (solid lines in the upper part) are from HD model of Spreiter et al. Dashed arrows show the low-energy ion flow, and closed dots (below) their parameters. Drafting errors in the originally published figure have been corrected. In particular, there is no component of solar wind flow into the wake anywhere on this pass. Fig. 14. Magnetosheath flow around Venus as measured by the Ames plasma analyzer in solar cylindrical coordinates - Vectors measured north of Venus are plotted in the upper half of the figure while the remaining vectors were measured south of Venus's orbital plane. Model ionopause and shock surfaces for Mach 8 and Mach 2 (dashed) are shown together with a Mach 8 streamline. The postshock plasma parameters have been compared with theory by Mihalov et al. (1980), Mihalov (1981), and Smimov et al. (1981). While there is rough agreement between the observed and expected decrease in velocity across the shock, Mihalov et al. find that the observed decrease in velocity is too small in 80% of the cases for solar zenith angles <70o. Furthermore, the observed magnetosheath ion temperature is close to a factor of two too low everywhere. These observations are supported by detailed case history models using the full gas dynamic modeling of Spreiter and Stahara (1980) in the study by Mihalov (1981). Deeper in the magnetosheath the observed ion temperature is found to be up to an order of magnitude too low. This observation is consistent with the significant decrease in ion temperature in the same region found earlier by Venera 10 (Vaisberg et al. 1976a), shown in Fig. 13. This could in part be due to the lack of information on the electron temperatures. However, in the terrestrial magnetosheath the electron temperature is seldom equal to the ion temperature, let alone greater than it. Furthermore, the ion densities are found to be less than predicted. Smirnov (personal communication, 1981) has reported that the observed ion temperature jumps were equal or somewhat lower than theoretical ones. A principal feature of the venusian magnetosheath is the boundary layer. This layer was characterized on different occasions by an unusually flat ion distribution function, by the depletion of the energetic tail of the ion spectra, and sometimes is seen as a rarefaction region (Vaisberg et al. 1976a; Romanov et al. 1978). Depletion of the plasma by the loss of energetic (1.5-3.0 keV) ions is clearly seen on successive spectra as measured on two revolutions of Venera 10 (Fig. 15). Magnetosheath spectra (12-5 for 10/31/75 and 10-6 for 11/6/75) show a gradual loss of the energetic tail of the ions while approaching the obstacle. This depletion is apparently due to the loss of energetic ions in the planetary atmosphere. The flow lines on which depletion occurs pass close enough to the atmosphere of Venus (comparable to twice the gyroradii of the energetic ions) for this depletion to take place. On the night side of the planet, quite far downstream, the boundary layer is particularly apparent in the kinetic parameters of flow. Velocity and ion temperature profiles obtained during the crossing of the venusian interaction region from the bow shock to the central part of the wake, at distances 5-8 R from the planet, are shown in Fig. 16 (Romanov et al. 1978). The boundary layer is seen as a decrease of velocity and rise of temperature, as in a viscous boundary layer. The velocity profile, calcuated from the ion energy spectra under the assumption that the flow consists of protons everywhere, changes monotonically across the wake boundary that was crossed at 0255 Moscow time. The temperature drops at the boundary of the wake. As we will see later, this seems due to change of the ion composition across the boundary of the wake. This viscous interaction transfers momentum to the ionosphere causing a decrease in velocity and an increase in temperature as the planet is approached; Fig. 16 agrees with this view. In the region of velocity decrease the temperature rises. On the other hand, these viscous boundary layer treatments of the interaction sweep under the rug the underlying plasma instabilities and wave-particle interactions responsible for the observed plasma behavior. The analogy may be valid, but it does not show how the momentum transfer or the heating occur. Two-component flow structure near the planet is often evident in the energy spectrum; in addition to the broad spectrum of shocked solar-wind plasma a narrow peak appears in the low-energy part of the spectrum. This peak can be seen in Fig. 15a (spectra 6-8) and Fig. 15b (spectra 5-6). This component is sometimes seen at larger distances from the planet. The number flux of these particles reaches ~ 106 cm-2 s-1, with temperature on the order of several eV and kinetic energy ~ 100-200 eV. The most probable origin of these ions is photoion pickup. With the probability of photoionization of venusian exospheric ionsf ~ 2 X 10-7 s-1, neutral number density 104cm-3, and path length in which ion pickup occurs L ~ 109 cm, we obtain number flux of photoions F = f n L ~ 2 X 102 cm-2 s-1. This compares favorably with the observed flux of low-energy component. One of the most important results of the plasma measurements on Veneras 9 and 10 was the detection of plasma flow in the venusian wake with quite different parameters from the external flow (Vaisberg et al. 1976c; Romanov et al. 1978). As Shown by Romanov et al. the jump in flow parameters occurs at the boundary of the wake. No definite identification of the source of these ions was suggested until recently, though their planetary origin was evident. The same plasma layer (mantle) was identified from measurements of electrons on Pioneer Venus Orbiter by Spenner et al. (1980), who defined the mantle as the region in which the suprathermal electron energy distribution changes continuously from one characteristic of the magnetosheath to one characteristic of the ionosphere. The solar wind was inferred to stop above the mantle, i.e., the mantle boundary rather than the ionopause is the anemopause. The magnetic barrier found on the day side of Venus (Russell et al. 1979a) helps explain the origin of the plasma mantle. The magnetic barrier develops as a result both of the current excluding the ionosphere from the magnetic field of external flow (for moderate solar wind pressure), and of magnetohydrodynamic (MHD) effects in the external flow. This barrier transfers the solar wind pressure to the ionosphere (Russell et al. 1979a). There are three possible sources of plasma in the magnetic barrier: relative diffusion of the ionospheric plasma and the magnetic field; photoionization; and charge exchange in the barrier. To understand some of the properties of the plasma mantle, it is not important how these ions enter the magnetic barrier region, but only that they accrete in the barrier at a specific rate. Zeleny and Vaisberg (1981) have considered a model of the plasma mantle using the assumption that the source of the ions found there is photoionization, together with some simplifying approximations about the dynamics of the magnetic tube in the solar wind approaching ionosphere. Part of the hot plasma filling the flux tube that decelerates on the day side will move along the tube, leading to its depletion (Zwan and Wolf 1976). At the same time the new photoions will fill the tube, and while it sinks into the magnetic barrier the solar wind plasma is replaced by new cold photoplasma. Subsequent motion of the tube containing the photoplasma is determined by the magnetic pressure gradient within the magnetic barrier (the magnetic tension term is comparable to, but smaller than, the pressure term). Part of the new plasma will move along the tube, but most of the new ions will move with the magnetic tube towards the terminator, since the parallel velocity of the ions is small. Solving the equation of motion of the magnetic tube with a photoion source determined by the density of neutral oxygen in the exosphere of Venus gives the following parameters of mantle plasma near the terminator (Zeleny and Vaisberg 1981): velocity ~ 60 km s-1, number density 4-5 cm-3 number flux ~ 2.5 X 107 cm-2 s-1. Figure 18 shows a sketch of the physics of the interaction. Fig. 18. Model of solar wind-Venus interaction (Zeleny and Vaisberg 1981). Subsequent locations of magnetic field tube are shown. Spirals are trapped photoions; arrows show the flow of low-energy ions in the wake. Observations of wake plasma at the distance ~ 0.5-1 R behind the terminator give a number flux smaller by an order of magnitude. This does not contradict the model, as the field tube should expand in the Wake by the factor of the ratio of wake radius to magnetic barrier thickness, i.e., by a factor ~10. Yet the energy of the directed motion of oxygen ions with velocity ~ 60 km s-1 obtained in the model of Zeleny and Vaisberg is almost twice as large as the energy of motion of the tail ions, ~ 150 eV (Vaisberg et al. 1976b; Romanov et al. 1978). Taking the exospheric: helium photoions as the source of the mantle, we obtain an even larger discrepancy between the model and the observed energy of wake ions. This discrepancy suggests that anomalous ionization processes investigated recently by Formisano et al. (1982) may be important in the formation of the mantle. The anomalous ionization process will lead to the earlier loading of the magnetic field tube by photoions and diminish the final velocity of plasma. Using the anomalous ionization criteria by Formisano et al. (1982); Zeleny and Vaisberg (1981) were able to obtain agreement between the model of Venus's mantle and observations. On the other hand, recent measurements of the critical ionization velocity phenomenon in weak magnetic fields (Brenning 1981) show that the critical ionization velocity effect disappears when the electron gyro frequency is much less than the electron plasma frequency, as it is everywhere in the vicinity of Venus. Fortunately, there are other candidates for increased ionization. Charge exchange certainly takes place. Furthermore, the photoionization rate is greater than that which was assumed, since the authors used the neutral atmosphere of Niemann et al. (1979a) rather than the more recent Nagy et al. (1981) calculations of the oxygen exosphere. Finally, recent studies by Mihalov and Barnes (1982) of the Pioneer plasma data suggest that O+ is moving at speeds close to but less than that of the ambient magnetosheath plasma near to and sunward of the terminator plane. The most intense fluxes occur at low altitudes, as do the lowest speeds. At altitudes above a few thousand km, the two speeds are comparable. Energy spectra of the low-energy ion component found on Veneras 9 and 10 are shown in Fig. 15 (two lowest frames on each of Fig. 15a and 15b). The temperature of these ions typically lies between 1 and 10 eV, with energy of directed motion ~ 150 eV. Closer to the center of the wake both temperature and energy diminish. The velocity of low-energy motion has a strong component towards the center of the wake (Fig.13). Immediately behind the planet there is a cavity where no ions with energy 50 eV were observed on Veneras 9 and 10 (Vaisberg et al. 1976c). Similar results illustrated in Fig. 19, were obtained by Verigin et al. (1978), who described their results in terms of an umbra and penumbra. The layer of plasma in the wake is thick at the high magnetic latitudes, where the vector to the spacecraft measured from the center of the wake is nearly orthogonal to the interplanetary magnetic field direction projected on the terminator plane. The layer of wake plasma is thin at low magnetic latitudes, where the spacecraft position vector relative to the center of the wake is almost parallel to the interplanetary magnetic field direction (Vaisberg 1980). Comparison of the directions of flows near the boundary of the wake, where two plasma components (external and internal) mix, allows us to estimate the mass of the ions in the wake flow. From the measurements of directions of flow and energies of mass motion of these components the velocity of internal flow can be calculated, taking into account that the axisdirected convection velocities of the two components are equal. This estimate gives an ion mass in the internal flow between He+ and O+, closer to O+. In this case the typical velocity of O+ ions in the wake is ~ 40 km s -1 with typical number density ~ 0. 5 cm-3. The transition from external to internal flow at the wake boundary is quite distinct, although sharper and more gradual transitions were observed. The thickness of the transition layer ranges from 100 to 500 km. Strong fluctuations in the magnetic field with ^B~B are usually recorded near the wake boundary. An example of a wake boundary crossing (Romanov et al. 1978) is shown in Fig. 22,in which a sharp transition from one flow regime to another one is seen, as well as strong magnetic field fluctuations. A burst of ions with energy ~ 2 keV is also observed at the boundary. Bursts of accelerated ions were observed at almost all crossings of the wake boundary. They usually lasted from 10 to 20 s in the spacecraft time frame. It appears that the acceleration of ions to an energy of several keV occurs permanently at the wake boundary and that it is associated with strong magnetic field fluctuations. As seen in both the magnetic field and plasma measurements, the Venus ionopause is very dynamic, often varying dramatically in height from day to day (Elphic et al. 1980a, b; Brace et al. 1980). Often what appear to be multiple crossings of the ionopause suggest that the ionopause has a wavy structure. However, sometimes a pair of ionopause crossings is so far from the rest of the ionosphere that it seems to be a detached plasma cloud (Brace et al. 1982a). If these plasma clouds are moving at the solar wind velocity or any significant fraction thereof, they represent an important loss mechanism for the Venus ionosphere and ultimately for the Venus atmosphere. At minimum these clouds must be moving with a velocity greater than the escape velocity if they are detached from the ionosphere. Figure 24 shows an example of a plasma cloud occurrence during a periapsis passage of Pioneer Venus, and Brace et al. 's interpretation of this feature. The magnetic field essentially reverses in a plasma cloud as if the field were pulling on the cloud. The location of this feature and the orientation of the field relative to the interplanetary magnetic field orientation is that which would be expected if the field lines were hung up near the subsolar point and bent into a hairpin shape. This feature is shown projected on the surface of the planet in Fig. 26. The plasma cloud and the bend in the field are along the noon-midnight magnetic meridian, the great circle through the subsolar point which is perpendicular to the interplanetary magnetic field. This observation suggests that the plasma cloud is, instead, a ridge of plasma on the ionosphere, presumably of flowing plasma. The plasma is accelerated and prevented from spreading by the magnetic field. Note the strong 100 Hz plasma waves occurring in the cloud. Increases in the plasma wave amplitudes are common at the ionopause but these have a different spectrum. The frequent occurrence of these clouds in the Pioneer data suggests that they are an important contributor to the loss of ions from the Venus ionosphere. The magnetic structure suggests that the dayside ionopause is not quasi hemispherical but rather ridged along a noon-midnight magnetic meridian. The two possible sources of these clouds or ridges are the ionosphere itself and the mass accretion region or mantle outside the ionopause. The first possibility leaves unexplained how the field penetrated the plasma; likewise, the second possible source does not explain how the field lines gathered so much plasma in their passage from the subsolar region. On the other hand, the cloud loss rate estimated here is not much different from the expected loss due to photoionization and charge exchange above the ionopause, and the field lines in the cloud must have swept across the entire dayside ionosphere before being observed. Nevertheless, the cloud formation is still somewhat of a mystery. It is clear that in the immediate postshock flow, especially near the terminators, Venus has a magnetosheath much like the magnetosheath of any other planet. But at low solar zenith angles, where little data have been gathered, the situation may be different; the flow directions may differ from gas-dynamic calculations and the observed velocity decrease across the shock seems too small. The ion temperature also seems too low, sometimes by almost an order of magnitude. This region begs for further exploration. Beyond the terminator the flow does not expand into the wake. The wake boundary is essentially impenetrable and the flow in the wake is different from the external flow. Close to the planetary ionopause the flow slows, the hot plasma density decreases, and the cold plasma density increases in the magnetic barrier or plasma mantle. This cooling of the flow, whether due to the loss of the high gyroradii ions from the flow because of their interaction with the atmosphere, or due to loss of the hot component due to charge exchange, presumably causes the rarefaction wave observed by Veneras 9 and 10 (Vaisberg et al. 1976b). Evidence for ion pickup is seen with the plasma analyzers in this region. As is evident in Fig. 13 this low-velocity component of the flow is very cold compared to the magnetosheath protons. Another ion phenomenon perhaps even more closely associated with the physics of the ionopause, is the formation of plasma clouds. We must admit, however, that the understanding of how these various features are related and what dominant physical processes control them is still rudimentary. All planets with an intrinsic magnetic field have a magnetotail, which arises mainly because of tangential stresses applied by the solar wind. If there were only normal stresses on a planetary magnetosphere, it would assume a teardrop shape and would not have a long tail. Comets also have long tails; one type consists of dust, but the other consists of flowing ions presumably constrained by the magnetic field of a cometary magnetotail. A comet is not thought to have an intrinsic magnetic field; instead, the cometary magnetotail is thought to arise by capture of interplanetary magnetic flux by mass-loading of field lines which enter the cometary atmosphere (Alfven 1957). Processes such as charge exchange, photoionization, and possibly even the critical ionization velocity process (Alfven 1954) will add mass to the field lines in the region of closest approach to the comet. This mass accretion slows the motion of the magnetic flux tube. The plasma near the comet moves more slowly while that farther away moves at the solar wind velocity. The field line then bends around the comet and stretches out in the antisolar direction. Eventually these draped field lines will slip through or around the comet. In analogy with Dungey's (1965) estimate of the length of the terrestrial magnetotail, we can estimate the length of a cometary tail as the distance the solar wind travels as the field line drifts through or around the comet. If this slippage past the comet takes about half a day, the resulting tail would be ~ 0. 1 AU long. However, the situation is not perfectly analogous. Once the field line has left the massloading region it will attempt to straighten itself, but can only do so slowly because of the added mass at the crook of the field line. We would expect this same cometary process to occur at Venus, though we cannot see any visible evidence for a venusian tail. The expected atmospheric loss rates at Venus, on the order of 1025 ions s-1, are many orders of magnitude below the loss rates for a large comet. However, our discussion in earlier sections demonstrates that processes analogous to those occurring in comets occur at Venus. We expect the field lines to be slowed as they move across the front of the planet. The plasma clouds discussed in Sec. II.E seem to be a manifestation of this process. The field lines then slip over the poles, or more precisely over the magnetic poles, of the planet, all the while trying to straighten up and thereby accelerating the plasma contained in the crook of the field line. This is what we expect, but do the observations support this picture? The Venera 9 and 10 wake data, however, appear so much like similar observations in the Earth's magnetotail that Dolginov et al. (1978) interpreted them in terms of an intrinsic magnetic field. The surprising aspect of this interpretation is that the field lines do not radiate from the polar regions of the planet, but are confined to a conical region expanding away from the core. As we discuss below, the tail observed by PV flares slightly but shows no evidence of converging on to the planet this rapidly. On the other hand, there are small regions of radial field lines on the night side of Venus associated with holes in the nightside ionospheric density. Perhaps observations of the magnetic field in these nightside holes led to Dolginov et al. 's interpretation. The interpretation is, of course, incorrect; Venus does not have an intrinsic field large enough to supply the magnetic flux in such a tail. Yeroshenko (1979) correctly pointed out that the Venus tail polarity was controlled by the interplanetary magnetic field. Currently, none of the various principals involved are holding out for an intrinsic magnetotail at Venus. There is agreement now that Venus has a magnetic and plasma tail. However, much of that field does not originate in the ionosphere but comes from the magnetic barrier and some of it, the older field lines, close across the center of the tail itself. It is perhaps incorrect to call such a tail induced, because it does not arise from either of the processes usually called induction. It is mainly an accreted tail. The tail in many respects seems similar to the Earth's tail, but this may be deceptive. It will be interesting to discover the exact interrelationship of the proton and oxygen flow regions to the magnetic structure. Furthermore, much work remains to be done on the microphysics of the tail. What is the cause of the plasma wave emissions seen bounding the tail? What is the usual hydromagnetic character of the tail current sheet and magnetopause? Is the formation of holes in the night ionosphere related to tail formation? It is clear from the observations reported above that Venus presents a fairly hard obstacle to the solar wind flow. Only a small fraction of the solar wind appears to be absorbed. Since the solar wind flows much faster than the speed of pressure waves, i.e. magnetosonic waves, a shock wave must develop in the flow. This shock wave both heats and deflects the flow. One might not expect the strength of this shock or its dependence on solar wind conditions to differ markedly from the terrestrial bow shock, since the plasma conditions in the solar wind at Venus are similar to those at Earth. However, it is of interest to see how the Venus shock differs from the terrestrial shock. Disparities that could affect the shock are: the scale size of the Venus shock, one tenth of the size of the Earth's; and momentum removal and mass addition by such non-MHD processes as charge exchange and photoionization. There are a variety of tests we may employ. We can examine the position of the shock, the jump in field strength and number density at the shock, the dependence of the structure of the bow shock on plasma conditions, and the wave phenomena seen upstream from the bow shock. The Venus bow shock was not crossed by Mariner 2 but was observed on all succeeding missions. The bow shock was roughly where it was expected to be for an obstacle the size of the planet. However, it was somewhat closer on the average than would be expected by scaling from our knowledge of the terrestrial shock and model calculations (Russell 1977). In fact, if the average Venus shock surface were scaled down so that it passed through the Mariner 10 shock crossing (Ness et al. 1974), the resultant shock surface would intersect the planetary surface. This observation prompted Russell (1977) to question whether, on occasion, the Venus shock could become attached to Venus as shown in Fig. 38. Even if the anomalous Mariner 10 crossing could be explained, there is still the implication that on the average 30% of the solar wind streamlines incident on Venus passed into the ionosphere, if we naively use the gas dynamic computations of Spreiter et al. (1966) to map the flow. This suggestion was criticized by Verigin et al. (1978) who claimed that there was nothing unusual about the Venus bow shock position as measured by Veneras 9 and 10. However, later analyses of an extended Venera 9 and 10 data base showed unequivocally that the subsolar bow shock, as well as the bow shock at the terminators, was well below the expected location (Smirnov et al. 1980). The subsolar shock is expected to occur at an altitude of ~ 3000 km, but the subsolar altitude of the bow shock is close to half this value. It lies only slightly > 1300 km above the surface of Venus, in surprising agreement with the initial estimate of 1450 km altitude, using only 7 data points and an approximate aberration correction (Russell 1977). A further surprise in the study of the shock location came with the availability of Pioneer Venus observations. The bow shock near the terminator (where the Pioneer Venus observations occurred because of the orbital inclination) was farther from the planet than it was during the Venera 9 and 10 mission (Slavin et al. 1979a). The extrapolated subsolar point was also higher, ~ 2270 km rather than ~ 1500 km, but still much closer to the planet than would be expected for complete deflection of the solar wind. However, when aberration corrections are made this difference is much less than originally reported (Smirnov et al. 1981). The unexpected closeness of the Venus bow shock is less easy to explain. The Venus ionopause generally appears to behave as an equipotential surface. If only 10% of the solar wind flow directly interacted with the ionosphere, a potential drop of ~ 5 kV would be applied across the planet (400 km s-1 times 10 nT times 1200 km). This is to be compared with the 40 V of the model of Daniell and Cloutier (1977) and the ~ 1 V of Zeleny and Vaisberg (1981). The solution of this paradox must lie in the nature of the interaction. If momentum is removed from the flow via charge exchange, then the direct interaction with the neutral atmosphere occurs via fast charge-neutral particles. The charged particles can flow around the planet in the usual way, in which the single streamline intersecting the stagnation point coats the entire ionopause. The direct loss of momentum to the atmosphere obviates the need to bend the flow as sharply around the planet, and the shock can turn more normal to the incident flow throughout the subsolar region. This blunter shock will be closer to the subsolar ionopause than the normal shock. The loss of momentum to the planet will also alter the mass flux contours seen in Fig. 37. Charge exchange does not alter the number density (although it could alter mass density) but it will drastically reduce the velocity of the plasma and thus reduce the mass flux crossing the terminators. This will lead to further reductions in the height of the shock in the terminator region, even though the shape might not be affected here. With recent advances in numerical simulations these ideas could be readily tested, but this has not yet been done; until it.has, we must treat these ideas only as a plausible scenario. On the other hand, observations of shock strength and calculations of processes that could lead to weakening the shock do support these ideas. Furthermore, studies of mass addition at the subflow point, a process which differs in sign from the effect of charge exchange, show the shock to move away from the obstacle (Cresci and Libby 1962). Finally, Slavin et al. (1980) have studied the dependence of the terminator crossing of the bow shock on the ionopause altitude, the Alfvenic Mach number, and the solar wind pressure. They find that the position of the shock near the terminators depends little on the ionopause altitude, and weakly on solar wind pressure. The correlation with Alfvenic Mach number is much higher (0.7), corresponding to a more distant shock at low Mach numbers. This correlation is presumably due to two factors: a change of stand-off distance, especially at the lowest Mach numbers; and a change in the flaring angle of the shock. Strictly speaking, the strength of the bow shock is measured in terms of its Mach number. However, we operationally determine how strong a shock is by measuring the jumps in magnetic field density and temperature or the decrease in velocity across the bow shock. At low Mach numbers 3 the jumps in magnetic field and density are very sensitive to the Mach number but they asymptotically approach upper limits as the Mach number increases above 3 (Tidman and Krall 1971). Mach number 3 is also the approximate dividing line between laminar and supercritical shocks. Supercritical shocks have abundant downstream ion heating, are more turbulent, and are presumably associated with upstream ion beams although this latter conjecture has not yet been adequately tested with terrestrial data. We would naively expect that since the bow shock stands in the flow, and therefore its velocity is equal to that of the solar wind but oppositely directed, the Mach number would be specified by knowledge of the upstream solar wind conditions. However, mass addition and charge exchange complicate the picture, so we cannot make this simple assumption, as we will demonstrate from observations. In summary, the observed inward displacement of the bow shock from its expected location, the observed weakness of the bow shock and the theoretical expectation of solar wind loss by charge exchange consistently show non-MHD processes to play a significant role in the postshock flow. However, we emphasize that to date these processes have not been incorporated in a selfconsistent model which calculates shock position and strength in a charge exchanging flow. The structure of the Earth's bow shock depends on the Mach number of the solar wind flow, the ratio of solar wind flow velocity to the magnetosonic velocity, the of the solar wind (the ratio of thermal to magnetic energy density) and the local angle between the upstream magnetic field and the shock normal (cf. Greenstadt and Fredricks 1979). The dependence of the structure of the Venus bow shock on the IMF direction was first pointed out by Greenstadt (1970) in the Mariner 5 data, the inbound shock being quasi perpendicular and the outbound shock quasi parallel. This outbound shock crossing is shown in the magnetic field as displayed in solar cylindrical coordinates in Fig. 42. The interplanetary magnetic field in the region labeled UW (Upstream waves) is Closely aligned with the shock normal. When the field direction changes abruptly at the end of the UW interval to a direction not so nearly aligned with the shock normal, the upstream waves cease. This behavior is very similar to that observed at the terrestrial shock. The Mariner 10 outbound shock crossing shown in Fig. 43 was also a quasi parallel shock and was similarly disturbed (Ness et al. 1974). Due to the very turbulent nature of the quasi parallel shock it is difficult to characterize these shocks or to look for subtle differences between them and their terrestrial counterparts; in the following discussion we will therefore examine mainly quasi perpendicular shocks in which the interplanetary field lies mainly in the shock plane. Note that there are significant differences in the spectrum of plasma waves as seen at Venus, Earth, Jupiter, and Saturn, shown in Fig. 46 (Scarf et al. 1981). The waves at the Venus shock are stronger at low frequencies and have a monotonic decrease with increasing frequency. Scarf et al. (1980b, 1981) attribute this to the difference in Mach number with heliocentric radius. This may be true, but another apparent difference is the ratio of ion to electron temperature, which seems much lower for the Venus magnetosheath than the other planets. From these differences Scarf et al. (1980b) conclude that the plasma instability conditions at Venus are not the same as those in the Earth's bow shock region. While this shows the existence of upstream hydromagnetic waves in front of Venus, it does little to answer the question of whether the venusian waves are different from the terrestrial waves. To do this we examine the Pioneer magnetometer data which are available at higher time resolution and for a greater time interval. Figure 48 shows four different intervals of upstream ultra-low-frequency waves at Venus and their terrestrial counterparts (M. M. Hoppe, personal communication, 1981). At the Earth in the IS EE data all four of these wave types are associated with energetic ions flowing back from the bow shock. These ion beams have properties that differ as a function of position. At the leading edge of the foreshock region, the region in which the ion beams are seen, the ion beams are narrow in both energy and pitch angle. Here the waves are weak or not seen. If waves are seen they are similar to those in the left-hand panels. The high-frequency waves seen at Venus are larger than at Earth; this is a general relationship, of which the examples shown here are typical. Deeper into the foreshock region low-frequency transverse waves are often seen with high-frequency (~ 1 Hz) waves superimposed on the low frequencies, as in the second pair of panels. Still deeper into the foreshock the beams become spread in pitch angle and energy and the low-frequency waves steepen, as in the third pair of panels. Finally, far behind the foreshock boundary the beams become very diffuse and the waves very steep with leading (trailing in the spacecraft frame) wavetrains called discrete wave packets. We caution that this comparison was made from a very large data base without regard to frequency of occurrence of events. Thus, while these examples are typical of the waves at Venus and the Earth when they occur, this does not imply that the occurrence rates are the same; an occurrence rate study has not been done. The upstream waves occur at slightly higher wave frequencies at Venus than at Earth, but slightly lower than at Mercury. In Fig. 49 we show the wave period of the low-frequency waves, shown in the middle two panels at Mercury, Venus, Earth, and Jupiter as a function of the interplanetary field strength (Hoppe and Russell 1982). The linear dependence of wave frequency on field strength is as would be expected if the generating ion beams had the same energy at each planet. This relationship says nothing about the flux in the ion beams, only that the generation mechanism generates roughly the same energy at each planet. Note that the calculated energy of the beams is slightly but not significantly less for Venus and Mercury than for Earth and Jupiter. Finally, we note that in the upstream solar wind VLF plasma waves associated with the electron and ion beams fiequently occur (Scarf et al. 1980b). These have potential to help probe the properties of the beams, but as yet a morphological survey of the waves in this region has not been performed. The observations clearly show that Venus has a well-developed bow shock, in many respects similar to the bow shocks of the other planets. It apparently generates upstream particle beams and their associated waves. It depends on interplanetary parameters and the orientation of the interplanetary magnetic field direction much like any other bow shock. Nevertheless, there are important differences. The Venus shock does not stand off from Venus sufficiently to allow all the postshock flow to pass around the planet. The shock jump in the magnetic field strength is not as large as expected. The best inferred Mach number in fitting the shock position and jump is less than the observed solar wind conditions imply that it should be. The overshoot at the Venus shock is somewhat smaller than that seen under similar solar wind conditions at the other planets. These differences imply that something else is occurring at Venus in addition to magnetohydrodynamic processes, probably charge exchange with and photoionization of the neutral atmosphere in the postshock flow. Our understanding of the solar wind interaction with Venus has come a long way since the initial Mariner 5 and Venera 4 measurements in 1967. In many ways we understand the Venus interaction as well or even better than the terrestrial interaction. The reconnection process between the magnetized solar wind and the Earth's magnetosphere has been difficult to understand and has been a source of controversy for two decades. The deflection of the solar wind by Venus seems much more straightforward, although our initial guesses were incorrect. We also might claim to understand the origin of the magnetic field in the Venus ionosphere better than in the terrestrial ionosphere. The model of Cloutier et al. (1981), even if it does not work when the ionopause is at high altitudes, seems to replicate the observational data when the ionopause is at low altitudes. On the Earth we still do not understand the dynamo mechanism which generates the terrestrial field. Nevertheless, there is still much we do not know. Fig. 50. Overview of solar wind interaction with Venus. Figure 50 is an update of a summary diagram of Vaisberg et al. (1976c). At that time only the existence of upstream disturbances was known, whereas we now know that these disturbances closely resemble those at Earth. However, the amplitudes are different, as is the frequency of occurrence of the various wave types. The bow shock is closer to Venus than expected and the velocity decrease and the ion temperature increase are smaller than expected. As measured in terms of the jump in field strength across the shock, the jump is weaker than at similar locations on Earth. We might be able to understand these differences better if we either had more observations near the subsolar shock, or if the problem were treated with a self-consistent computer simulation taking into account charge exchange, photoionization, and the Zwan and Wolf effect. The geometry of the distant tail seems well defined both in the magnetic and plasma data. The Pioneer Venus, Venera 9 and 10, and Mariner 5 data provide a similar picture. However, much work needs to be done in determining the relative morphology of the field and plasma regions and the variation of the tail structure with solar wind dynamic pressure, etc. The structure of the near tail and wake region is still not completely understood. Perhaps this is in part due to the asymmetry caused by the magnetic field. The mantle is thick at high magnetic latitudes and thin at low latitudes. From the plasma data it is clear that the tail is connected to a plasma filling region. However, the 3-dimensional field and flow patterns here have not been settled. The definition of the ionopause is also murky in this region: there does not always seem to be a well-defined transition between a low-field, high-density ionosphere and a high-field, low-density magnetic barrier. Many of these questions can be resolved with the present data, and others with data to be gathered in the continued operations of Pioneer Venus. It is still too early to tell which problems we will not be able to address with present measurements, but past experience indicates that there will be some, and each new solution also spawns new questions. accumulated at that time. A lot more detailed info and graph-data is inculded in the original document made by C. T. RUSSELL and O. VAISBERG. Venus Express has detected the molecule hydroxyl on another planet for the first time. This detection gives scientists an important new tool to unlock the workings of Venus’s dense atmosphere. Hydroxyl, an important but difficult-to-detect molecule, is made up of a hydrogen and oxygen atom each. It has been found in the upper reaches of the Venusian atmosphere, some 100 km above the surface, by Venus Express’s Visible and Infrared Thermal Imaging Spectrometer, VIRTIS. The elusive molecule was detected by turning the spacecraft away from the planet and looking along the faintly visible layer of atmosphere surrounding the planet’s disc. The instrument detected the hydroxyl molecules by measuring the amount of infrared light that they give off. The band of atmosphere in which the glowing hydroxyl molecules are located is very narrow; it is only about 10 km wide. By looking at the limb of the planet, Venus Express looked along this faint atmospheric layer, increasing the signal strength by about 50. Hydroxyl is thought to be important for any planet’s atmosphere because it is highly reactive. On Earth it has a key role in purging pollutants from the atmosphere and is thought to help stabilise the carbon dioxide in the martian atmosphere, preventing it from converting to carbon monoxide. On Mars it is also thought to play a vital role in sterilising the soil, making the top layers hostile to microbial life. The reactive molecule has been seen around comets, but the method of production there is thought to be completely different from the way it forms in planetary atmospheres. “Because the venusian atmosphere had not been studied extensively before Venus Express arrived on the scene, we have not been able to confirm much of what our models tell us by observing what is actually happening. 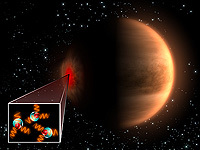 This detection will help us refine our models and learn much more,” says one of the Principal Investigators of the VIRTIS experiment, Giuseppe Piccioni, from the Istituto di Astrofisica Spaziale e Fisica Cosmica in Rome, Italy. Venus Express has shown that the amount of hydroxyl at Venus is highly variable. It can change by 50% from one orbit to the next and this may be caused by differing amounts of ozone in the atmosphere. “Ozone is an important molecule for any atmosphere, because it is a strong absorber of ultraviolet radiation from the Sun,” says Piccioni. The amount of the radiation absorbed is a key parameter driving the heating and dynamics of a planet’s atmosphere. On Earth, it heats the stratosphere (layer of the atmosphere) making it stable and protecting the biosphere from harmful ultraviolet rays. Computer models will now be able to tell how this jump and drop in ozone levels over short intervals affects the restless atmosphere of that world. First detection of hydroxyl in the atmosphere of Venus”, by Piccioni et al. Using observations from the Venus Express spacecraft, an international team of astronomers presents the first detection of hydroxyl (OH) in the atmosphere of Venus through its nightglow emission. Observing atmospheric airglow is a major tool for inferring the composition and chemistry of the upper planetary atmospheres. These results will be published in Astronomy & Astrophysics. Astronomy & Astrophysics is publishing the first detection with the Venus Express spacecraft of hydroxyl (OH) in the atmosphere of Venus. The OH “radical” is a very special and reactive molecule, which is unusual in conventional chemistry because of its reactivity. Using the VIRTIS instrument onboard Venus Express, an international team of astronomers  observed the light emission from the night side of Venus's atmosphere and detected the presence of the OH radical in the spectra. The Venus Express spacecraft has been orbiting Venus for more than two years and has already provided planetologists with a handful of new results . Fig. 1 - Nightglow emission from OH and O2 in the atmosphere of Venus. The spectrum shows the emission lines from OH (at 1.44 and 2.80 microns) and from O2 (at 1.27 and 1.58 microns). Except for one of the O2 emission lines, all three other features have never been observed before on another planet besides the Earth. & Krysko 1976), but only an upper limit of 50 R was obtained. most probable mechanism of excitation. high degree of correlation in altitude with the O2(a − X) bands. airglow on Venus where ozone abundances are smaller. its effect on the ozone abundance. The same calculation can be made for the (2−0) transition. the observed value of 0.3 MR (Connes et al. 1979). be quite hot and variable with time and latitude (Bertaux et al. model calculations for Mars (Zhu & Yee 2007). for production of CO2 on Venus. occurring on Earth and Mars. Are there any numbers and calculations available on the time it took with the Electric Universe Theory for Venus to come to the current orbit after being ejected from Jupiter as I. Velikovsky suggested? - Does anyone know where to find data on the temperature of Venus' cloud tops since the first satellites went to Venus up to the most recent data? I think this data was mentioned in the Thoth forum or somewhere at kronia.com at one time, but I can't find it. I think they showed that Venus' heat is decreasing so many degrees per year. - A person called Andre' at http://physicsforums.com/showthread.php?t=2974&page=1&pp=15 said "A lot of new evidence has been uncovered. For instance studies now indicate that the geology of Venus assumes temperatures up to at least 1050K in the past (777 degrees C). Hence Venus is cooling, hence there can not be a thermal Greenhouse gas runaway mechanism in whatever form." I think it's now 480 C, so 777 - 480 = 297 divided into 5,000 years = .06 degrees per year. If we can get the current rate of cooling and if it's near .06, then Venus could be 5,000 years old, since its birth. - Earth is now about 30 degrees C so it could have formed about 12,500 year ago, but climate evidence from ice cores etc seems to indicate that the temperature has oscillated up and down for a few thousand years at least. - I think most of Velikovsky's followers who discuss the orgins of Venus now agree that Venus likely erupted from Saturn, not Jupiter. Dave Talbott's, Wal Thornhill's and Dwardu Cardona's theories seem to have replaced Velikovsky's in popularity, based on scientific evidence. Talbott and Cardona independently concluded in the early 70s, I think, that Earth was initially a satellite of Saturn. Then it seems that Thornhill persuaded everyone that the Saturn system was not even in the Solar system until a few thousand years ago. At about that time Venus erupted from Saturn and was seen on the face of Saturn, while Mars was between Venus and Earth. Instead of orbiting Saturn, the 3 planets were in polar alignment with Saturn's pole. Cardona has said that Jupiter was likely also in polar alignment usually over Earth's south pole. He says Earth seems to have flipped over at a later date, so that Jupiter appeared to replace Saturn at the north pole. - If the Saturn system came apart near the asteroid belt, which is now between the orbits of Mars and Jupiter, then Venus was thrown farthest inward, Earth second-farthest, and Mars the least, while Saturn moved outward farthest and Jupiter least. All of those planets were likely on elliptical orbits for a time. Thornhill seems to say that the magnetotails of the planets caused their orbits to circularize, but I don't know if he has stated how long it likely took. - Have you checked out http://holoscience.com or http://kronia.com/thoth.html? Keeping in mind, that the circularization of Venus' orbit in a Newtonian only universe is problematic, and this, and celestial mechanics in general, triggered the rejection of Worlds In Collision by astronomers. While Newtonian mechanics seems to apply quite well to the observed motions of the present order of the solar system, this is because a disturbed system is going to move toward a point of least action interaction, between the magnetotails (plasma sheaths) until stability is reached. charged celestial bodies within space-charge sheaths of limited dimensions. But there may also be another factor. [...]after being ejected from Jupiter as I. Velikovsky suggested? I think that the majority of catastrophists are of the opinion that Velikovsky strayed away from the requirements of his own methodology by asserting that Venus was born from Jupiter. He placed too much emphasis on a Greek myth, when in fact the preponderance of worldwide mythological evidence points to Saturn. Thanks for all your answers. I'm asked myself if there are just some basic calculations available that would make it plausible that such a circularization could happen in the EU without problems (with a 39 magnitudes stronger force) in a very short timeframe. That would be a nice argument in a discussion about the EU setting compared to a purely Newton/Einstein space. - I think Robert Bass or someone did find a mathematical formula by which chaotic and highly eccentric orbits could be circularized fairly quickly, but I don't think it took electrical forces into account. It seems like it was discussed in Kronos magazine. I remember a photo of him or someone else with a model of a toroid with curved paths all over it. I guess it was a computer-generated model. - Lynn Rose and I guess Robert Bass also had an earlier model for orbit circularization back in the late 70s with an article in Pensee' magazine, as I recall. But Nick's quote of Thornhill above seems to be the best lead nowadays. Maybe the former model from Bass also has some relevance. Last edited by Lloyd on Mon Jun 09, 2008 6:52 pm, edited 1 time in total. venn wrote: Are there any numbers and calculations available on the time it took with the Electric Universe Theory for Venus to come to the current orbit after being ejected from Jupiter as I. Velikovsky suggested? venus was at some part of time a part of Jupiter???? can you give some links?? A friend of mine, professor emeritus at UW, has a 3-body computer model/simulation of the circularization of Venus' orbit along with the capture of the moon by the earth. Entirely Newtonian from my understanding. It is based on the assumption that at one time Earth and Venus orbited at a distance of just 15 million miles from each other, allowing for the "gravitational locking" of the the two planets currently observed. That should keep you out of mischief for a while. Welcome aboard.